How one marketing company beat their annual goal in just 7 months! Client Tales: Noisy Little Monkey on How to Hit Your Year Target in Seven Months! We love our clients and we love our clients’ success stories. That’s why we couldn’t wait to share the story of Noisy Little Monkey search engine optimization and social media marketing company, who closed their year-end goal five months early, providing great service and doing what they love to do. Because that’s what it’s all about, right? Jon Payne: I’m the founder and Technical Director of Noisy Little Monkey. Noisy Little Monkey is a digital marketing agency that grows businesses through optimized search, stunning social and user centric web design. Jon: To be honest, I don’t normally love it. As the business has grown in the last few years, I’ve begun to miss getting my hands dirty and doing the actual work! But, if you put me on the spot, I’d have to say that the bit I really enjoy is seeing the people I work with develop into quite amazing business people. I’m so privileged to work with these clever, inspiring people. Jon: I scrunch up my eyes real hard and dream that I’m riding a jet ski, while wearing a business suit. Being filmed by helicopters. We’d tried using Microsoft Word and Excel, but as we grew we needed something clever for CRM that also had a quoting system. So we tried a Norwegian system called Office 24seven, but that wasn’t a good fit for us and it ran exclusively in Internet Explorer, which rather finished it off. Then as a last ditch effort we got a trial of Highrise and Basecamp for CRM / Project Management and were casting around looking for a system that would tie in with them. I downloaded the trial and absolutely FELL IN LOVE with Quote Roller. I’m still in love with it. We’ve been together for six months – this isn’t some passing fad, Quote Roller and Noisy Little Monkey were meant for each other. Jon: Oh man. Where to start? It makes our proposals look vastly better than our competitors from old school marketing land, which since the client is buying an online solution gives us an awesome head start. Designing the proposal templates is so easy. We’ve built 4 from scratch… to do all of them took less than half a day. We’re going to redo them in the new year to include video and better copy – it’ll take a little longer, but it will look amazing on a client’s screen. It used to take me days if not weeks to get round to quoting for stuff – because while we use kind of standard services, they’re always customized for the client in some way. The way the Quote Roller catalogue works I can slap the standard services into a quote line by line, and edit them really easily as necessary. Sometimes since using Quote Roller, I’ll leave a meeting, find a good mobile signal and work on the proposal immediately – copy and paste my notes from Evernote onto the coversheet, add in and edit the services, products, subscriptions and boom, the client will get the fees straight away. That just stinks of WIN, doesn’t it? Talking of subscriptions, I love the way it puts these in a separate total so the client doesn’t see the annual total all bundled together. We’d always struggled with that and Quote Roller fixed it instantly. I love that you can set a price / quantity by day, page, hour when you’re setting up a service / product. I adore the email that comes through saying that a client has looked at a proposal, particularly when it’s followed by the “proposal accepted” email. My colleagues love that they can log in and look at what I’ve quoted for a client and discuss it directly with the client without me being involved. Importing accepted proposals into Basecamp which become projects with each line as a task. YES! Arriving at forecasting meetings with little or no prep yet having all the key sales numbers to hand. HEAVEN. Being able to see send vs view vs acceptance rates. PIPELINE-TASTIC. The fact that I’ve only used the support email once in 6 months (and I got a speedy, personal reply). I love all of it. Did I mention how much I love it? Jon: I tell them all the time how good it is, that they should be using it. How there isn’t a better quoting system for SMEs online or offline. Jon: It’s difficult to say if we’ve seen win rates increase directly attributable to Quote Roller, because it used to be so hard to measure on other systems that I’d given up. What we can prove is that I’m sending out more quotes, more quickly for stuff that used to slip through the net. 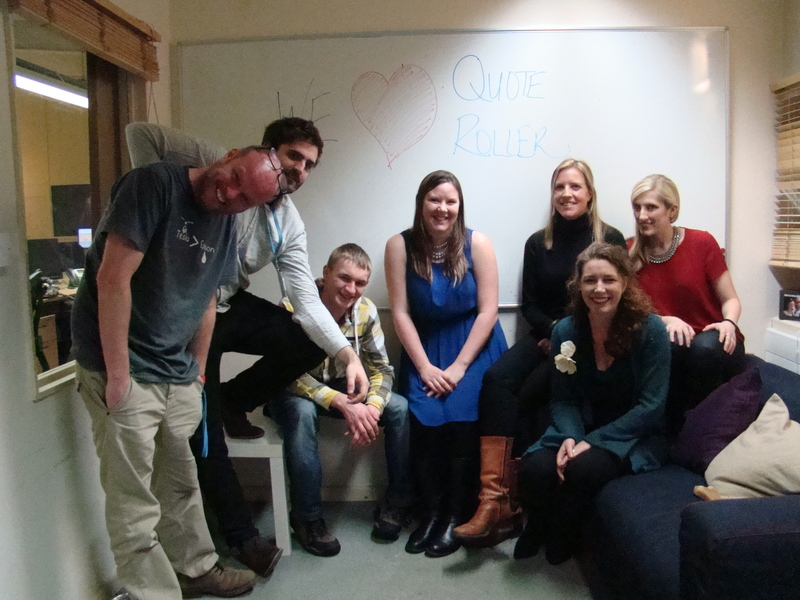 Unquestionably, using Quote Roller has been a significant factor in Noisy Little Monkey hitting profit target five months ahead of schedule in 2013.